I got this a few minutes ago from my uncle. I want to personally thank the writer of this editorial for reminding me to never take for granted the FREEDOM we have been given to live in the GREATEST country in the WORLD: the United States of America. There is no other way to describe this as anything but BRILLIANT!!! The past couple weeks, and in fact the past nine and a half years, I have experienced a roller coaster of emotions, ranging from anger, sadness, frustration, fear, pride and excitement. I’m sure by now, everybody has heard that an elite team of U.S. Navy Seals killed the world’s most wanted terrorist, Osama bin Laden, in a fierce gunfight in Pakistan. I woke up Monday, May 2 and was checking my e-mail when I saw a story on comcast.net that said “bin Laden Dead.” I just sat there for a second and made sure I read what I thought I had. I immediately flipped the television to CNN, and they had a breaking news story about the U.S. military killing the former Al-Qaeda leader and mastermind of the horrible terror attacks in New York and Washington, D.C., on September 11, 2001. I’m still in disbelief because it came as quite a shock that we have been chasing this scum bag for almost 10 years in the mountains and elaborate cave system near the Afghanistan-Pakistan border. Then before everything registers, I found out that we stumbled upon a $1 million compound, and one of our brave men in uniform shot bin Laden in the head!!! I still remember where I was on that horrific, sad, tragic day when more than 3,000 innocent Americans were killed when highjackers commandeered three planes and slammed them into the World Trade Center towers and the Pentagon. I was in my third semester of college and had just gotten to school when I noticed several people huddled around a television in the first classroom as you walk down the hall. The TV was on breaking news, and I saw smoke coming out of the first tower. It really didn’t register what I was watching until I saw the second plane hit, and I think I was still in shock and really couldn’t believe what I was seeing. While I was sitting in class, I remember a few people still talking about it, and still trying to fit my head around what I was seeing and hearing. I was still pretty young, 19 years old, and the concept of terrorists slamming planes into the WTC towers seemed unimaginable. I’d never really heard about terrorism before September 11, but now we hear it all the time. I remember driving home and think I remember hearing the news on all the radio stations I was flipping through. When I got home I turned on the television and saw all the carnage; people running for their lives; paramedics, police officers and firemen racing to get people to safety. I remember seeing the looks of horror, sadness and disbelief on the people’s faces who were running away from the towers and the sounds of sirens filling the New York air. It was at THIS moment, seeing all of the smoke, terror, panic and destruction that it FINALLY hit me like a ton of bricks that America was under attack. My first thought was HOW the hell could ANYONE take out two towers, kill thousands of innocent people and cause such destruction? All I knew was that once President George W. Bush and his administration found out, there was definitely going to be hell to pay, a war this world has never seen, and the terrorists who did this would soon find out why the men and women of the U.S. military are some of the bravest men and women on this PLANET!! THEN I find out that there was a fourth plane that crashed in a field in Pennsylvania. I can’t remember where this plane was headed, I think it was to the White House, but I have to say I have NEVER been more proud of complete strangers taking charge and overpowering those damn terrorists before any more lives were lost. I cannot even fathom how scared they were and how much courage it took to come together to form a game plan to fight those scum bags in the cockpit and take the plane back over. I would PERSONALLY like to congratulate each and every one of those brave passengers on that flight for opening up a big ol’ case of American whoop @$$ on the terrorists and having the idea to crash the plane in the field to avoid more destruction. Who knows what would have happened if they hadn’t taken the plane down?? 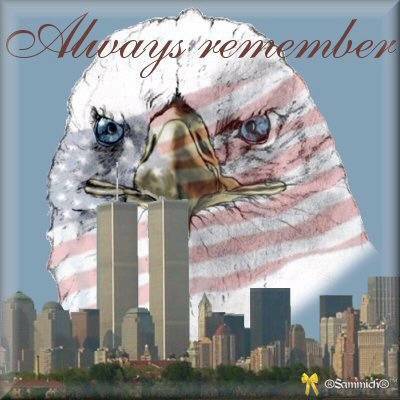 I remember the days and weeks following the attacks, I felt this AMAZING sense of pride for my country, and a stronger determination by America to NEVER back down when we are threatened. I remember seeing the cleanup efforts going on in New York and Washington and remember feeling so sad for those families who will never get to see their mom, dad, brother, sister, daughter or son again. But the ONE single image that will live with me FOREVER is the picture of our president, George W. Bush, standing side by side with a fire fighter with a bullhorn in his hand. I remember there was a crowd gathered around and they were chanting something. I remember the president saying something and one guy yelling, “We can’t hear you!! !” President Bush yelled back, “Well, I can hear you. America can hear you. And soon the people who took these buildings down will hear ALL of us soon!! !” I still get chills and a lump in my throat when I think back on this show of patriotism by our president, and the fact that he took the time to visit Ground Zero to visit with the families and the emergency personnel who were working night and day to rescue people. I’ve never been more proud of my country and our president than I was at that moment because I knew, I KNEW, America would be okay, and we would overcome and be stronger than ever before. What I mean is I was tired of seeing people suffering, people crying and the rescue efforts 24 hours a day, seven days a week, nonstop. Sure it’s okay to see once every two or three days, but if there’s nothing new to report, leave it alone. I am sure I’m not the only person who got tired of hearing the same things over and over again. I knew I needed a new outlet to kind of ease the sadness and heartache I was feeling, so I turned to one of the best sources of healing for me: music. I am a big country music fan because the artists sing about real life, love, hope, God and family. I knew beyond a shadow of a doubt that country music would help get me through the pain, sadness and heartbreak I was feeling inside after September 11, and was I EVER right. I immediately started listening to all the music I could, whether it was on the radio in my room, in my van on the way to or from class, or my CD player. One of the artists I have always loved is Alan Jackson because his songs are straight from the heart and are so full of emotion, patriotism and hope for a better tomorrow. I remember watching the Country Music Association awards a couple months after the attacks, and remember Alan singing one of the GREATEST songs ever, “Where Were You When the World Stopped Turning?” He wrote the song shortly after the attacks, and it really, really made me step back and praise God for the life I have been given because you never know when it will all be taken away in the blink of an eye. I remember clinging to every word of that song and feeling the powerful emotion when Alan sang it live on the awards show. I almost cried the first time I heard it, and still to this day get emotional and feel an overwhelming sense of pride for America and its resolve to overcome obstacles when faced with adversity. America can achieve anything it sets its mind to when we all pull together and work together to have each other’s backs and help each other in times of need. I want to personally thank Alan Jackson, wherever he may be, for writing one of my favorite songs of all time, and for reminding us to never, EVER forget where we were when the world stopped turning. Now, getting back to the Navy Seals and their heroic efforts when they took out Osama bin Laden. I wish I could find them and thank each and every member of Seal Team Six for risking their lives to eliminate one of the worst enemies America has ever known. I want every member of the U.S. military to know how much I respect, admire and love them for risking their lives every single day to protect our freedom at home and abroad. We never asked you to go out and defend your country. You took it upon yourselves to fight for what you believe in and defend the freedoms we’ve been given, and for that I will be forever grateful. I just hope America agrees with me that our military is the most AMAZING fighting force the world has ever seen and will take the time to thank a soldier, airman, sailor or anyone else in uniform for putting their lives on the line for you. It doesn’t have to be someone who is serving/has served in the military, either. Thank your local police officers, fire fighters, emergency personnel, paramedics and anybody else who goes out to help others when their lives are in danger. As I close, let me say what an honor and a privilege it is to live in the most AMAZING, GREATEST country in the world, the United States of America. I love this country so much and would not want to live anywhere else. Thank you to all those who keep our country safe while I sleep in peace at night. It is because of you that I am able to get up every day, praise my Heavenly Father and go live my dreams. I’ve achieved so much the past three or four years, but will never, EVER forget the men and women who have made the ultimate sacrifice so I can live my dreams. God Bless America!!! As you read this story I received in my e-mail this morning, I hope you will remember to take a few minutes out of your busy day to praise God for always being there to hear our heart’s cry when we are facing a tough situation. I also hope and pray that no matter what show comes on television or how long you’re in that staff meeting that you will at LEAST take thirty seconds to praise God for allowing you to even have that 50-inch plasma big screen television or a job to go to every day. We are some of the blessed people in the world to have as many things as we do, but how many times have YOU stopped to thank the ONE who has always been there when you needed Him most? I noticed that before lunch you looked around, maybe you felt embarrassed to talk to me, that is why you didn’t bow your head. You glanced three or four tables over and you noticed some of your friends talking to me briefly before they ate, but you didn’t. That’s okay. There is still more time left, and I hope that you will talk to me yet. You went home and it seems as if you had lots of things to do. After a few of them were done, you turned on the TV. I don’t know if you like TV or not, just about anything goes there and you spend a lot of time each day in front of it not thinking about anything, just enjoying the show. I waited patiently again as you watched the TV and ate your meal, but again you didn’t talk to me. Bedtime I guess you felt too tired. After you said goodnight to your family you plopped into bed and fell asleep in no time. That’s okay because you may not realize that I am always there for you. I’ve got patience, more than you will ever know. I even want to teach you how to be patient with others as well. I love you so much that I wait everyday for a nod, prayer or thought or a thankful part of your heart. It is hard to have a one-sided conversation. Once again readers, I bring you a very inspirational message I received in my e-mail this morning. This is probably one of the most inspirational e-mails I’ve ever received and what a powerful message, knowing that we will never have to worry, be sad, doubt, fear anything or have to walk alone in darkness because Jesus is the Creator, the Beginning and the End, the Light at the end of the tunnel, our Healer and our Redeemer. I hope this message ministers to your heart to praise God tonight before you go to sleep for ALWAYS knowing what we need and what we are feeling, even when we think He doesn’t care. Yes friends, because He lives, we can face tomorrow. I know He is the beginning, so why do I worry about the end. I know He is the creator, so why do I wonder who will destroy. I know He has forgiven me, so why can’t I forgive myself. I know He is a healer, so why do I speak of sickness. I know He can do all things, so why do I say I can’t. I know He will protect me, so why do I fear. I know He will supply all my needs, so why can’t I wait. I know He is my strength and my salvation, so why do I feel weak. season is over do I weep instead of rejoice. I know He is the right way, so why do I go the wrong way. I know He is the light, so why do I choose to walk in darkness. what I can do today. I know that the truth shall make me free, so why do I continue to lie. I lean on my own understanding. why do I choose to live in the spirit but walk in the flesh. I know I am saved, so why do I refuse the word He has given me. eager to do His will, when it is His time not my time. I received this in my e-mail this morning and thought I’d share with my readers. It never hurts to be reminded that whatever we’re facing, we’ll always have someone right beside us. As you may know by now, unless you’ve been hiding in a cave on the border between Pakistan and Afghanistan the past five months, I work for the city of Marietta’s public information office. I love working for them but one thing that really gets on my nerves is having to create a new password every 90 days. Now I get it, they’re trying to keep all employee’s files and e-mails private and secure, so nobody can come in and hack into their accounts. I really commend and congratulate our technology department because in my line of work, I occasionally receive something by e-mail that has to remain confidential until a certain meeting or ceremony, like Marietta’s annual end-of-the-year employee service awards. But let’s face it, I’d much rather spend my time writing news releases, updating our website and designing the city’s Friday e-newsletter than having to come up with a 25 character password just to login to our network. I just wanted to login so I can do my work, not train for an undercover, covert position with the CIA, whose job it is to gather highly confidential intelligence on the whereabouts of Al-Qaeda’s number two man!!! Another thing that I can’t stand is when my computer freezes up at work, and I can’t get on the Internet to look for something on the city’s website, check e-mails or finish writing an article so I can take it to my supervisor so he can approve it before I post it to the Web. I came back from lunch this afternoon after eating pizza with grilled chicken on it for lunch (pretty good, you ought to try it!! :)) and was able to logon with my new 16 character password with no problems. But then I sat there for the next three and a half hours just waiting on my computer to wake up from its coma… I was working on about three news releases and was also checking agendas for things that might be discussed at next week’s City Council meeting. I wasn’t sure if everybody was on the Internet at once and there was a lot of traffic or if there was a bad virus going around. Turns out there was a problem with one of the servers and it was getting fixed. I know I could have done something else while I was waiting for my computer to straighten itself out, but I really didn’t have anything else that I could do. I just let the technology guys do their thing, and the problem was resolved about 3:30, I think.